I hope everyone had a lovely Mother's Day. We had a lovely time here in NYC - perfect weather (blue skies, sunshine, but still crisp and breezy), my parents came to visit for the weekend, and Penelope is starting to sleep through the night. Isobel was so excited to spend time with her grandparents, though she wasn't too keen on the idea of a day that was about mommy and not her. A while back my mother mentioned that she would, after all, like a pair of fingerless mitts to keep her hands warm up in Wisconsin, so I decided to knit her the Wine and Roses Mitts from IK in the called-for yarn (Jade Sapphire cashmere 2-ply - yum!). They turned out very nicely, and she was quite pleased with them, particularly the color. I sent those cable footies to my Grandmother not too long ago so thought I'd make her something a little silly. She does have a shawl, lap blanket, cap, gloves, and footies from me already, so there isn't too much more to knit for her as we head into summer. I hope she likes this little orange, which was great fun to knit (Franklin Habit's pattern over on Knitty). The orange yarn is leftover from her gloves, and the green is some Cascade Heritage. I would have preferred a hand-dyed green for a leafier effect, but it is still cute. And I finally made a Hemlock Ring blanket for myself. Love it! I used some sheepy Lopi that the woman who used to own my old house gave me (I think she'd found it at the Transfer Station). The yarn is almost like pencil roving and had a lot of vegetable matter throughout, but picking it out sort of added to the enjoyment (I know, weird). 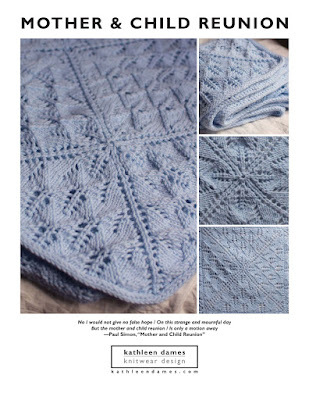 I love the contrast between the lacey pattern and the serious, heavy-weight yarn. I've been tempted to try the Hemlock Ring for a while, but I'm not 100% sure that I understand the pattern ... yours is really lovely, though. You are so incredibly prolific! How do you do all these things? I try and try, but can't knit fast enough! SOOO pretty!